How Do We Land from the Sky of “Modernity”? This essay is based on lectures by Professor Bruno Latour as part of the series, Introduction to Art and Culture in Global Age undertaken at the Graduate School of Global Arts, Tokyo University of the Arts. Informed by the lectures by Latour, this essay mainly aims to report “Reset Modernity!”, his most recent curatorial practice at ZKM, Center for Art and Media, Karlsruhe, Germany. At the end of this essay, it also analyze the different attitudes towards problems of modernity by analyzing and referring to the unique case of the modernization of Japan. This exhibition is mainly comprised of 6 procedures (sections) to reset the instruments of the modern regime that disorients us. Moreover, a portable book called “Field Book” is provided for the audience in order to promote interaction between exhibition and the viewers. It provides not only the description of the presented works but also explains the reason why the curators selected those works as well as gives discussion topics to help self-education of the audience. 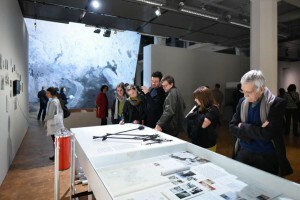 Organizing the exhibition in this manner enables the (western) audience to reconsider the relationship between such the “western gaze” and “representation”, the distinction between “observer” and “nature” under the notion of “the sublime” and various frameworks of modernity and “Land” itself. It is noticeable that this exhibition reflects the strong interest of Latour and his team in the recent controversial discussions on the concept of “Anthropocene”. Thus, inevitably one can describe Reset Modernity! as a critical challenge to the problems of “modernity”, due to its differentiation of such as subject and object, society and nature or human and non-human. It is feasible to mention that in these circumstances Japan holds a unique position under this condition as it modernized not through “revolution” but through “restoration”. Referring to Claude Lévi-Strauss’ analysis of Japanese culture, Japan achieved modernization without severing the continuity between its traditional mythical cosmology and history as a modern nation style and thus, Japan has somehow been able to manage the balance between traditional value and rapid growth of science and technology.［＊2］This unique modernization has its roots in Japan’s singular and strange creativity in juxtaposing and absorbing the two opposing extremes such as awe of animistic thoughts and radical technological reformation. Therefore, if one follows Latour’s discussion of “hybridization”, it could be said that the very structure of Japanese modernization is one built on a process that in itself has been fundamentally “hybrid”. This extraordinary Japanese cultural background has been producing and updating numerous “hybrids” while also managing to retain its identity. It is probably reasonable to say that this technique of “landing” could be one of the reference points to approach the several problems of “modernity”, of which Latour spoke of during his lectures. ＊1──Quoted from his presentation in the lecture on July 15, 2016. ＊2──Lévi-Strauss, C., Translated by Junzo Kawada, Tristes TropicsⅠ, Japanese edition. Chuokoron-Shinsha, Inc. 2001, from a preface “Unknown Tokyo”, pp. 3-9.